Format: bilingual DVD, 3 eps., 75 min. Comments: A more than fitting conclusion. Every story must someday come to an end. Some stories simply leave you hanging while others leave you with a bittersweet conclusion. 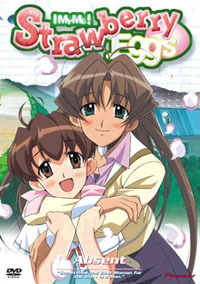 For some viewers, Strawberry Eggs might've seemed like a series that was too different for its own good. And granted, it was. Still, every episode told a unique story and had a blast while doing it. Sure there was plenty of fan service, and that whole cross-dressing thing going on with Hibiki, but that just made the DVDs all the more worth while. As such, the final conclusion is the perfect complement to a series that prided itself on being different. Episodes 11 through 13 round out this DVD and take us on a torturous trip to the place where we knew we would eventually end up - with the revelation that Hibiki is in fact a man! To make matters worse, there is evidence to show that he is having inappropriate relations with one of female students. Hibiki is faced with the hardest decision of his life... continue his charade or come clean. His decision might just surprise you. Moving away from the situation involving Hibiki, we are also given more insight into the ongoing struggle between Akira and Fujio who have been reeling since their rejections last volume. As a person who knows the hard sting of high school rejection all too well, it's almost sad to see the pain these characters are put through. It's also more disturbing to know Kuzuha's reason for not wanting to go out with Akira. My only problem with this volume comes from the horribly cliché outcome of episode 11. In this episode, people are turning up missing and when Kuzuha doesn't show up to school, everyone freaks. Hibiki manages to find Kuzuha and inadvertently causes a fire that puts them both in danger. The cliché part comes when Ba-chan comes riding in on her transforming motorcycle to save the day. Oh well, Kuzuha is a weakling after all. The final segment of the bilingual tour videos is but one of the highlights of this last volume. Though shorter than the others, it features a look at the key faculty and staff of Seitow Sannomiya Private School. To say we get to see a different side of the principle would be an understatement. Other extras include an exceptional nice full-color art gallery that features much of the artwork used for both the DVD covers and the inserts. The other major extra comes in the form of a series of TV commercials. Though they aren't subtitled and are quite repetitive (as most commercials are when viewed in sequence), some of the commercials feature live actors placed as a girl is given a love letter by a boy as people come and go in the background. And with that the domestic release of Strawberry Eggs draws to a close. What'll be the next unique series that fans will pass up? My money is on Sugar.